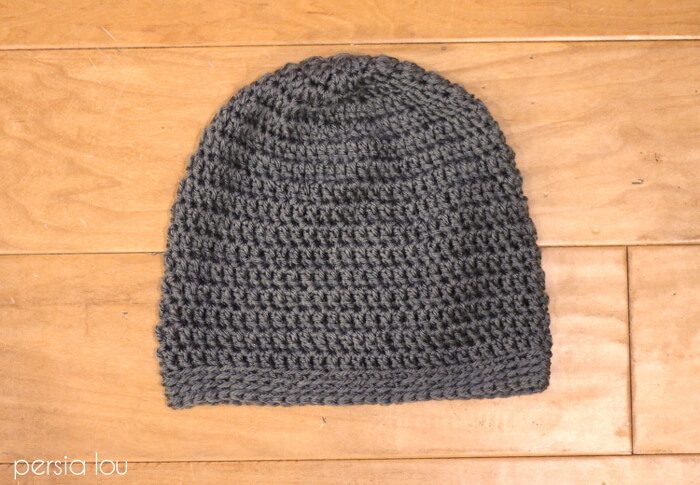 This crochet slouchy hat is great pattern for a crochet beginner. This cute and simple crochet hat pattern works up quickly, looks great, and makes a great gift. 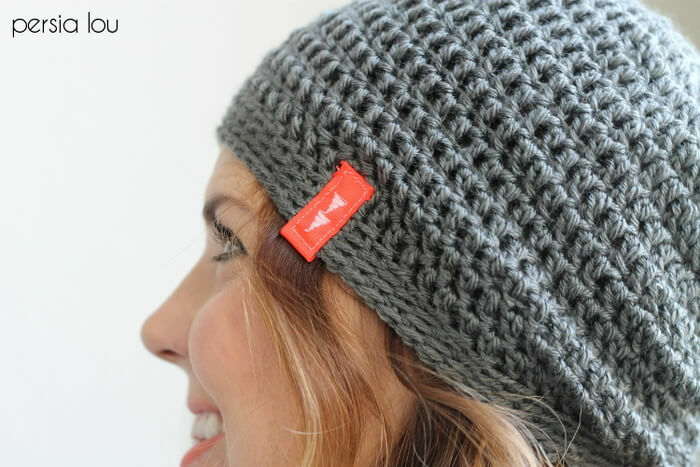 Ready to learn how to crochet a simple slouch beanie? Let’s go crochet! 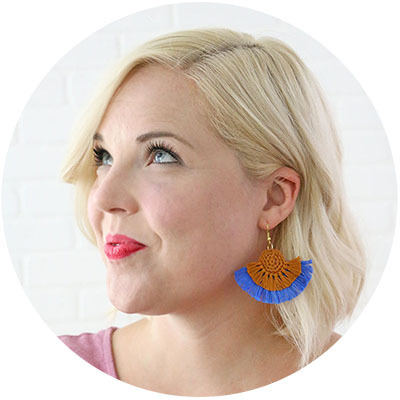 This post was originally shared by me on the Darice blog and may contain affiliate links, which help to support this site. A couple years ago I had the opportunity to teach a couple of ten and eleven year old girls how to crochet. They were just adorable, and we had so much fun learning and practicing the basic stitches. Once we had the basic stitches down, we started actually making things with my Simple Pencil Pouch Pattern, and then I came up with the pattern for this little hat to teach them how to crochet in the round. The girls loved it, and it was so fun to see them excited about making their first hats! 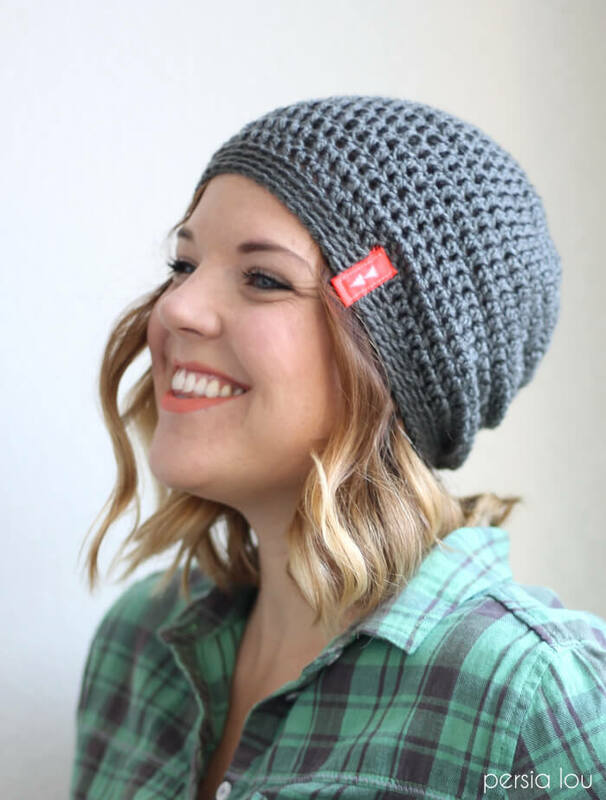 This crochet slouchy hat pattern is super duper simple – simple enough that I could offer it up as a second pattern to brand new crocheters! But a few simple techniques and touches make it look and feel special. 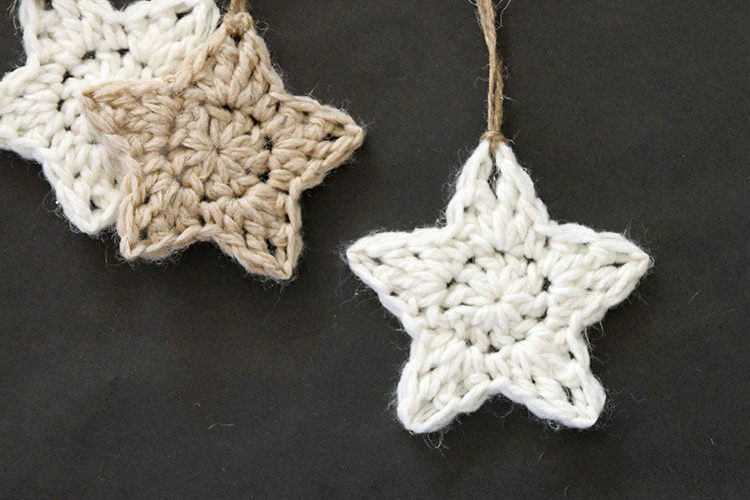 Please note: This pattern is free for personal use only and uses American crochet terms. Rnd 1: Starting with a magic loop (If you don’t know how to do a magic loop, check out this video here. It gives you a tighter hole in your finished piece, which is great, If you don’t want to try the magic loop, just ch4, sl st to form a loop and work the remaining stitches in that loop. ), ch 3 (counts as dc), 11 dc in magic loop, sl st to join, pull to tighten (12 dc). Rnd 2: ch 3, dc in same st, 2 dc in each st around, sl st to join (24 dc). Rnd 3: ch 3, 2 dc in next st, * dc, 2 dc, repeat from * around, sl st to join (36 dc). Rnd 4: ch 3, dc, 2 dc, * dc, dc, 2 dc, repeat from * around, sl st to join (48 dc). Rnd 5: ch 3, dc, dc, 2 dc, * dc, dc, dc, 2 dc, repeat from * around, sl st to join (60 dc). Rnds 6-16: ch 3, dc in each st around, sl st to join (60 dc). Rnd 17: Work in back loops only (see image below), ch 1, sc in each st around, sl st to join (60 sc). Rnds 18-19: Repeat Rnd 17. Finish off, weave in ends. 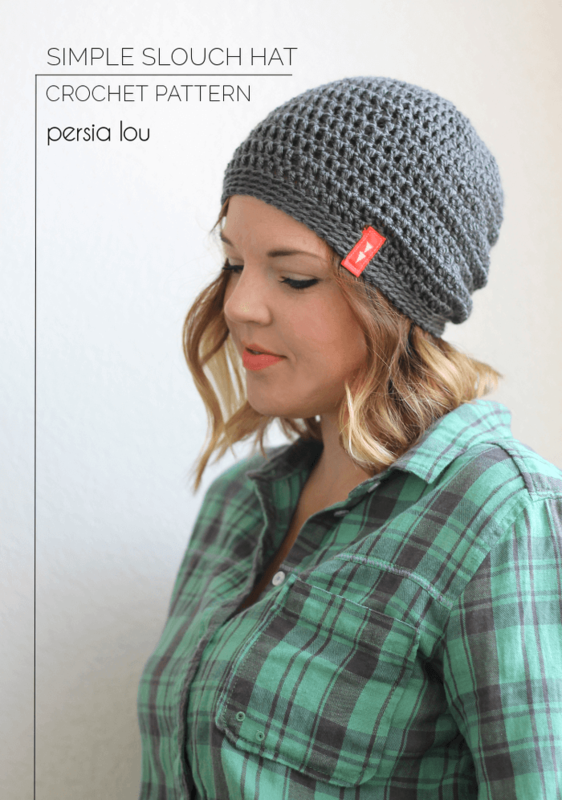 At this point, your Simple Slouch Crochet Hat is complete! If you want, you can add a little grosgrain ribbon tag to the brim of your hat like I did. It’s a simple detail, but I think it gives the hat a lot more personality. 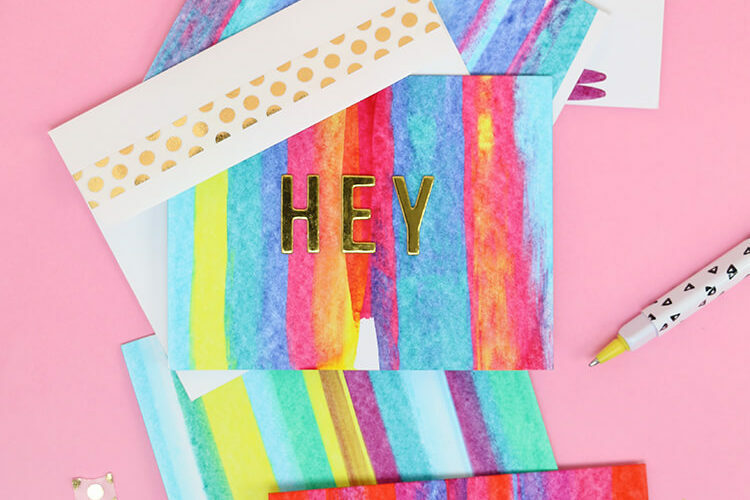 To make your own ribbon tag, cut a piece of ribbon 4-5 inches long. You could attach the ribbon plain or add a design to the ribbon. If you have a sewing machine, this is a great time to play around with some of the special stitches. I added two triangles to my ribbon. After you have sewn a design onto your ribbon, all you need to do is attach the ribbon tag to the hat. 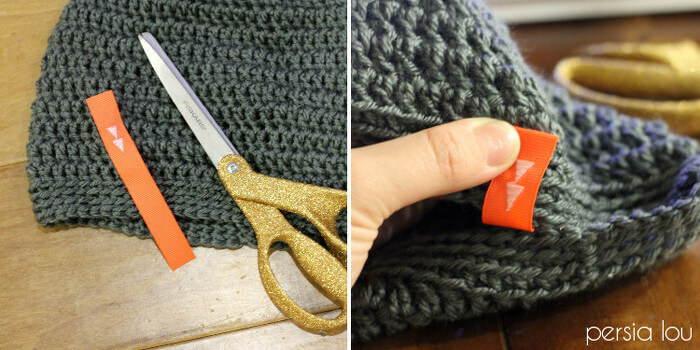 Simply fold the ribbon over the brim of the hat and sew it on. I found it was easier to attach the tag using a needle and thread instead of my sewing machine. This hat is simple enough that you have plenty of time to whip up a whole bunch for holiday gifting. Switch up the embroidery and colors for lots of different looks! 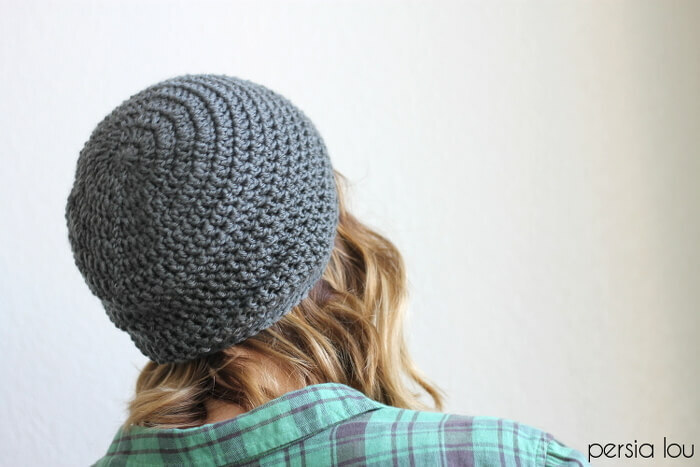 If you make your Simple Slouch Crochet Hat, I would love to see it! Share your photos to my facebook page or tag me on instagram or twitter (@persialou), and don’t forget to use the hashtag #persialou for a chance to be featured. You&#39;re seriously the cutest in photographs! I am not a crocheter but if I ever started I&#39;d look to your tutorials for guidance. Absolutely love how your hat turned out! I tried making it and it turned out looking Bob Marley inspired, (so it is still wearable) however, I want it to look like your example. Do you have any idea what I could have done wrong as to why my hat is huge? Luckily I decreased on the final row, otherwise it was looking like a huge floppy bowl! Thanks!! Hi Nicole! 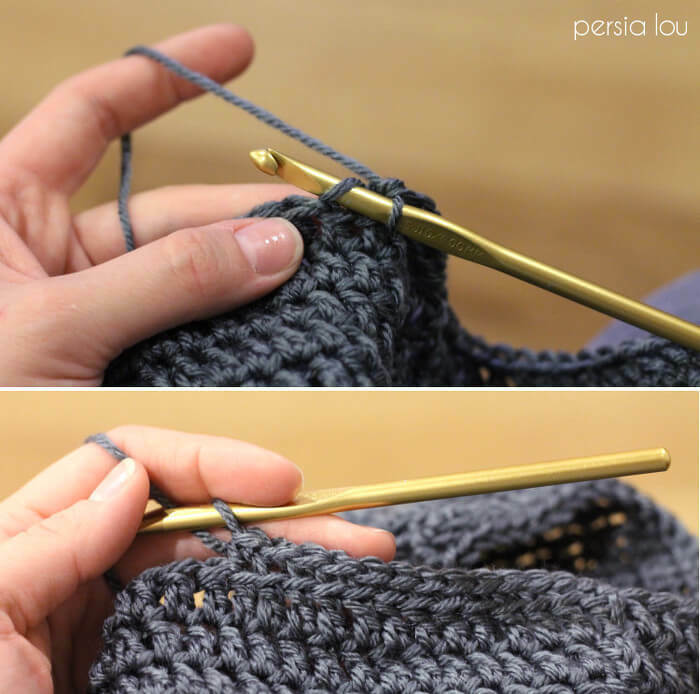 It may be that you just crochet a lot looser than I do or possibly that your yarn is thinner. I would recommend trying the pattern again with a smaller hook – maybe a G or an H. If that is still too big, then you can try eliminating round 5 so that you only have 48 dcs in each round instead of 60. I hope that helps! Good luck! I&#39;m going to give this a try.